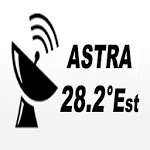 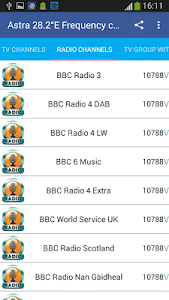 "Frequencies of Channels Astra 28.2 E" gives you detailed information about the old and the updated frequencies in 2019 for all TV and Radio channels on the orbit 28.2° E.
• Easy to use with a simple interface for TV channels, Radio. 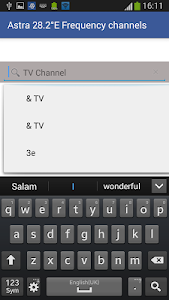 • You can enter the channel name you want to find detailed information. 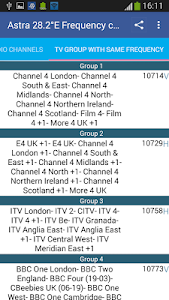 • You can enter the frequency you want to search and list all the TV channels with the same frequency. 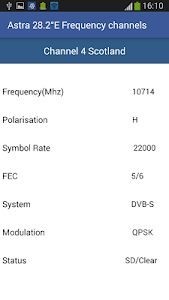 • This application requires no Internet connection. 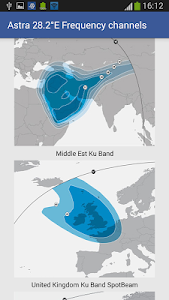 All frequencies belong to the following satellites (same orbit 28.2° East): Astra 2E / Astra 2F/ Astra 2G. 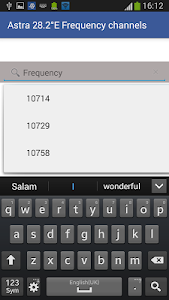 languages ​​App that should be supported by Phone: English, Arabic, French, Italian, Spanish, German and Turkish. 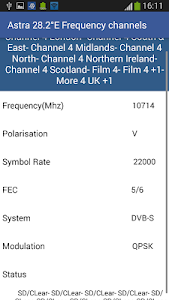 Similar to "Astra 28°E Frequency Channels"